Orlando, Florida is perhaps one of the hottest destinations for both commercial and private charter flights in the nation. With virtually limitless things-to-do, a bustling business and corporate economy, and many airports from which to choose, picking the right charter flight to Orlando can seem a daunting task. At Charter Flight Group, we take the anxiety out of the choice. With over 30 years experience in charter flight service, Charter Flight Group is in a unique position to help anyone find exactly the right private aircraft as well as the perfect Airport to serve as your entry to Orlando. If you are traveling alone, perhaps all you need to charter is a Cessna Caravan. If you are bringing along your entourage, you may need something slightly larger like a Citation Jet or Falcon 50. Or perhaps, you plan on bringing the entire crew along. In this case, your private charter flight may be better served by a Global 5000 or a Boeing 737, equipped for luxury travel naturally. Regardless of your private flight needs, we has the charter plane to suit you. Of course, we understand that safety and convenience are your main concerns when booking your private charter jet, so one of our flight consultants can be reached 24/7 and provide you with the peace of mind that nothing will be left to chance. In addition, we see to it that all charter aircraft exceed FAA regulations by performing regular safety audits through ARGUS and WYVERN. This ensures that your flight will be safe, smooth, and on-schedule. When you book your private jet through CFG, you are ensured of service to the best and most exclusive airfields in Orlando. If privacy is a concern, you may ask your private flight consultant to book your flight to enter Orlando Executive Airport. Located in the heart of Orlando, this airport does not serve commercial flights, ensuring privacy along with speedy and dignified service by Transit Authorities upon landing. In addition, this airport provides door-to-door service so that your ground transportation may be waiting on the tarmac upon your arrival. Of course, perhaps privacy is not a concern. Perhaps you would like PR opportunities upon your arrival by private jet. No worries. Just plan to have your charter consultant arrange for a landing at the adjacent Orlando International Airport. Both Orlando International and Executive are situated close to the downtown business district and provide easy access to the finest hotels and lodging. If you prefer a more remote area, just to the north and north-west you may have your private jet land at either Sanford or Apopka. Or maybe you would like to land closer to such attractions as Disney World. In this case, your charter flight crew may bring you to Kissimmee. Regardless of your needs, CFG consultants can see to it that your private charter trip is perfect. 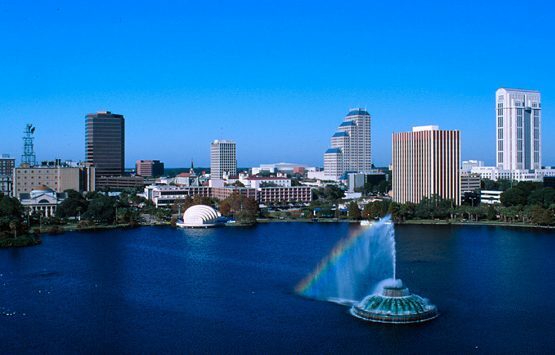 For Corporate travelers, Orlando provides some of the most fertile companies in America with which to do business. Disney World and affiliates is the single largest employer in the region, with over 53,000 employees, not to mention Universal Studios. Wal-Mart has a large distribution facility, both the State of Florida and Federal Governments have numerous important offices located in Orlando, and the healthcare industry is well-situated here. Whatever your business requirements in Orlando, CFG consultants can match you to the right airport. Of course, with Disney and Universal in town, your business trip may not be all business. However, besides these attractions, Orlando boasts a wide array of other venues for your amusement and relaxation. Cirque de Soleil, Epcot, and Sea World are among the most popular attractions your flying consultant can arrange. In addition, there are many fine gardens, golf courses, professional athletic events, and museums one can visit. Why Choose Charter Flight Group for your Orlando Charter Flight? Why should you choose Charter Flight Group when booking your private charter to Orlando?